The March prompt for Ali Edwards‘ One Little Word online class involved “doing one little thing,” taking an action to pursue your one little word for the year. I put several little things on my list (typical overachiever – and I wasn’t sure one little thing could actually be that powerful). But my favorite, the one I’ve continued to do, is buying myself flowers on Mondays. There’s a Chinese man who spends his days at the entrance to the Downtown Crossing T stop on Washington Street, surrounded by pots of tulips, daffodils, snapdragons, roses, carnations and whatever else he’s offering that week. 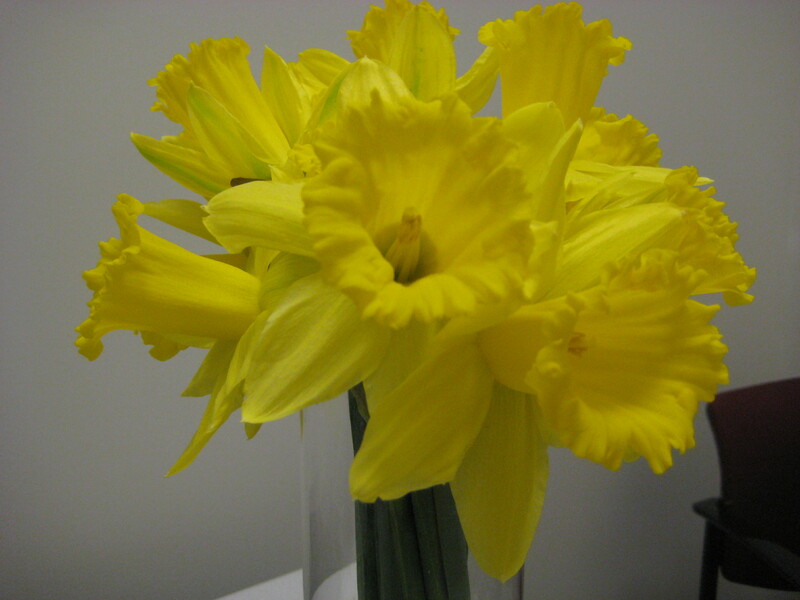 Prices start at $2, for a half-dozen daffodils, and I decided I could definitely afford that. And oh, it’s made such a difference in my weeks. 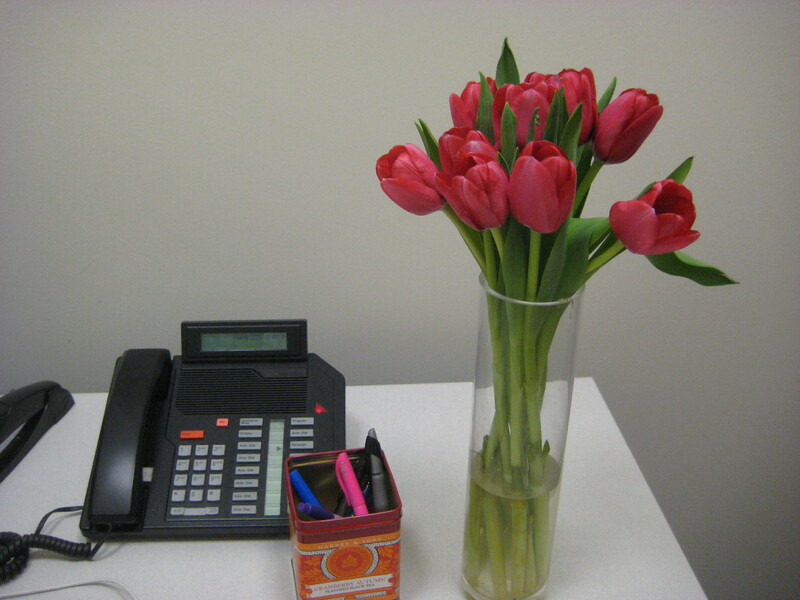 That vase full of vivid color, sitting on my gray desk in my taupe office in my glass-and-steel building, brings spring inside, and brings it alive, for me. It’s a comfort on gray or cold days, a reassurance that this too shall pass. It’s also a comfort in the sense of luxury – it feels like a splurge, even though it’s now something I do nearly every week. 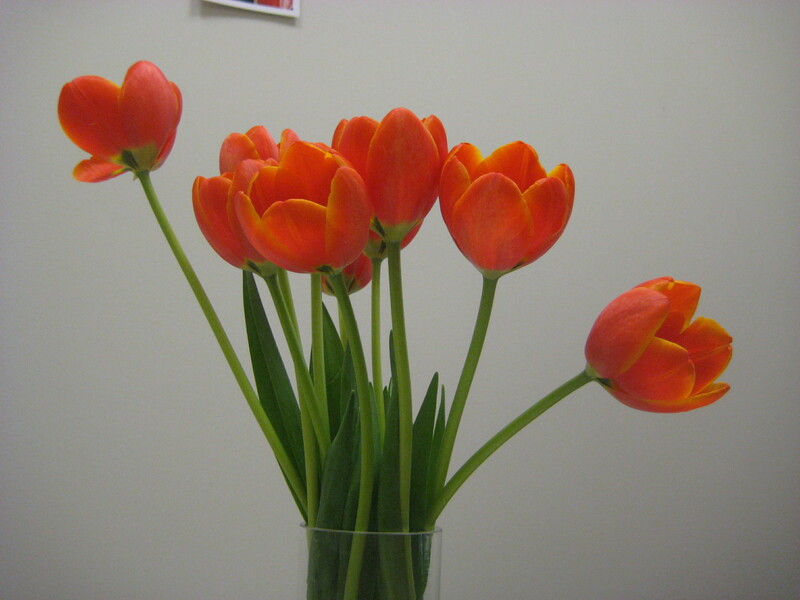 And it reminds me of the line from Hopkins’ poem “God’s Grandeur” – “There lives the dearest freshness deep down things.” Somehow, it freshens my writing and editing to have tulips or daffodils blooming at my elbow. Are you following a word or an idea this year? Or is there “one little thing” you do to brighten your days? I thank God for “Rainy Days and Mondays” and the time to write. I love how small the world is. I bought flowers from that same man – as well as from Brattle Square florists in Harvard Square (run by the nicest couple imaginable). What a beautiful ritual; thank you for bringing color into my week! Good for you! I adore flowers and rarely have them, although my anniversary was last week and I’m still enjoying some beautiful roses from my sweet husband. I haven’t found affordable, consistent flowers here in Houston. 😦 I’m glad you’re treating yourself! I started doing this when I was in an office and it made all the difference in the world. Suddenly. cubicle life is inspiring and indulgent! I do have two words that I’m keeping in mind these days: “full” and “unapologetic.” I want to be both, about everything. My husband bought me flowers regularly this year since I’ve been so sick in January/February. It always cheered me up. Flowers definitely brighten your days.